Hanging something from a rearview mirror (dice, dream-catchers, pearls, etc.) might seem silly, maybe even dangerous. But when my sister gave me a sweet little elephant charm she brought back from Fiji, I knew immediately where it would live: hanging from my car’s rear view mirror. Like most Asian good-luck charms, it’s a cheerful red and gold, creating great travel energy. While not officially a collector, I have a few other elephants. A bit more than an inch tall, this elephant was my only souvenir from a family trip to Disney World over 15 years ago. Our accommodations were upgraded to The Animal Kingdom Lodge. 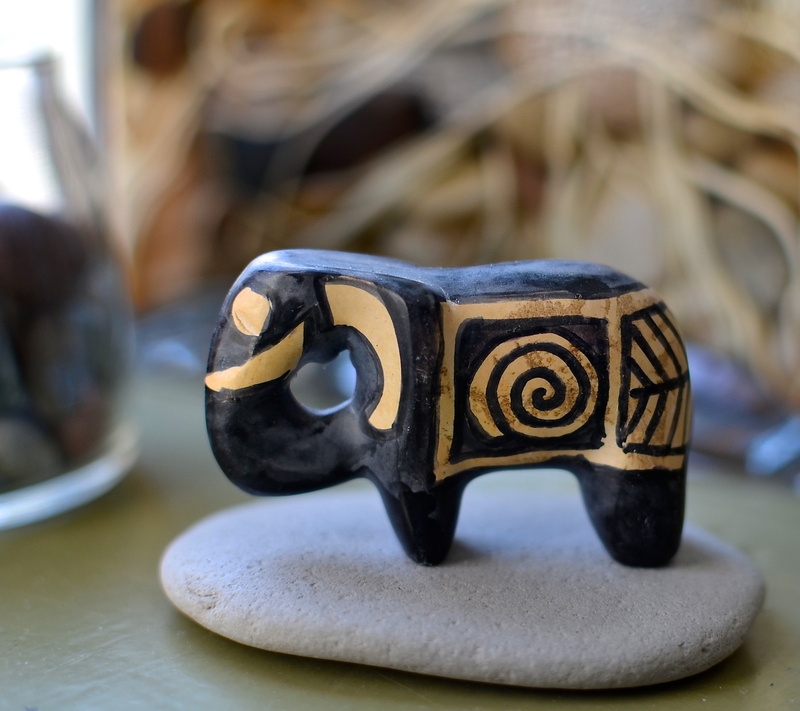 I chose this little creature from it’s gift shop, where African art and crafts from took precedence over Micky. This Genesha was also a gift from my sister. She found it at the Kripalu Center, where we’ve visited for yoga workshops over the years. Genesha is not an elephant, but a Hindu god with an elephant’s head. Embodying the elephant traits of wisdom and strength, Genesha is worshiped as a remover of obstacles. My mother found this tiny gold elephant while traveling in Asia. I’m not sure of it’s exact country of origin, but it’s stylized form is unique and beautiful. Martin Luther King Jr.’s quote about hope has remained on my mind since January 18, the day set aside for reflecting upon how far we’ve come, and how far we still have to go. Martin’s dream continues to be fraught with disappointment. Elephants symbolize not just wisdom and strength, but also patience, gentleness, loyalty and compassion- reminders of what’s needed to keep hope infinite, and dreams alive. I’m grateful for my small, unofficial collection of elephants, and that there’s a place to hang one of them from the car’s rear view mirror. Infinite hope is not silly, and dreams of peace can never be dangerous.